Author: Karl-Gottfried Prasse †. Series edited by: Harry Stroomer. The present course is designed to be an introduction to the Tuareg dialect of the Ahaggar or Hoggar region of Algeria, as well as the adjacent Azzar and Ahnat regions. This dialect is spoken by a minority of some 43,000 Tuareg speakers and some 10,000 beyond the Libyan border. Thus, it is a small dialect, compared with those of Niger (about 1,000,000 speakers) and Mali (about 500,000 speak­ers). However, it is a very important dialect for research purposes as it was the object of some of the earliest and best studies into the Tuareg language and culture. Outstanding are the great four-vol­ume dictionary and the texts compiled by Charles de Foucauld during the early years of the 20th century, which are still a source of important information to modern scholars. The Tuaregs have their own alphabet called tifinagh. The tifinagh are derived from the ancient Libyan alphabet, used for funerary inscriptions. Some of these can be dated back to 150 BC, e.g. the im­portant funeral inscription of the Numidian king Massinissa that can be seen in modern Dougga (Northwestern Tunisia). The tifinagh alphabet only writes the consonants (plus a dot for the final a, and sometimes a final w or y for u and i). Not even the long vowels are written, as is the case in Arabic, and traditionally the words are not separated. This makes it extremely difficult to decipher longer texts, even for Tuaregs. This is the reason why modern scholars and the literacy services (Services d’Alphabétisation) of the modern states have developed an alphabet based on the Latin one. This is also the alphabet adopted for this course. Once you have mastered the Hoggar dialect (tahaggart), it will be easy for you to move on to the other dialects of the Tuareg language, especially those of the Adrar of Mali (tadghaq) and of the re­gion of Timbuktu (tenshart or taneslemt) that are akin to tahaggart. With published grammars and dictionaries of all major varieties, Tuareg is an unusually well documented language in comparison to the rest of Berber and to Africa in general. However, relatively little of this documentation is in English. For Tuareg as a whole, while two reference grammars in English exist – Heath (2005) for Mali and Kossmann (2011) for the Aïr Mountains – the only other grammar course in English is Sudlow (2001), describing the southeastern Tuareg varieties of Burkina Faso. Prasse makes far fewer concessions to the learner's need for fixed phrases and daily greetings than Sudlow, but I found Prasse’s presentation of the grammar rather clearer; in particular, Prasse’s practice of introducing each conjugation separately with discussion makes them much easier to learn and understand than simply presenting paradigm tables without further comment. The southern varieties two of which Sudlow describes are spoken by far more people than the northern variety described by Prasse, so learners who simply want to be able to talk to Tuareg are likely to find Sudlow's book closer to the varieties spoken by their interlocutors. For northern Tuareg, however, this is the first linguistic reference in English. For beginners, this book makes an excellent introduction to Berber grammar; experts will appreciate the very clear overview it offers of Tahaggart Tuareg, and may well find that it helps clarify their understanding of the Berber verbal system. 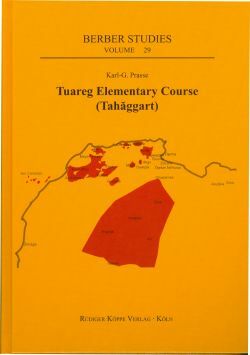 The Tuareg Elementary Course is the first publication which aims at application of the linguistic knowledge of this language in practical use. [...] Even though the course is not really enough to learn how to speak Tuareg, it is a good starting point for exploring the language. Especially it is considered to be essential for studying the works of Charles de Foucauld. The book can be used as a manual for learning conjugation of Tuareg and a means to understand basic rules of its grammar.